About Medical Electronic Systems / Rimoni IND : I believe I have two major business achievements. The first is providing both jobs and professional challenges to the people who work at our company and the second is developing products that solve real medical issues and are broad based in nature such as the YO platform. My focus is on product art/design. It is a skill to make a new product both user friendly, targeted to your consumer and make it beautiful and functional. This is a team effort - between engineering, manufacturing and marketing. It's a real skill and I believe our team hit it correctly with the YO Home Sperm Test. 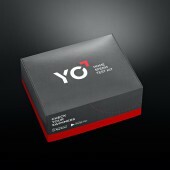 At first a 'disposable' product, we heard that our customer base just couldn't throw the YO device away. They were using the device as a Smartphone holder! Our clients are are customers who use our product. The YO home sperm test clip for which we are applying for an award is designed at MES by our staff under my guidance. Press Members: Request an exclusive interview with Medical Electronic Systems / Rimoni IND.